Check off another box for Henrythenavigator: running against older horses? No problem. Granted, there were only two four-year-olds in the Sussex Stakes field and they were well-beaten, but it’s another milestone for the colt. 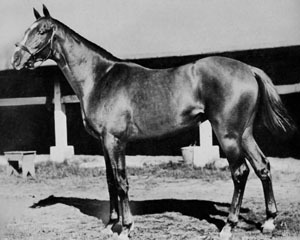 Raven’s Pass, an American-bred Elusive Quality colt (who has now finished behind Henrythenavigator three times), did press him at the end, but Henrythenavigator still prevailed. At this point, there seem to be few challengers to Henrythenavigator’s dominance at the mile; New Approach has beaten him once, but then suffered two subsequent defeats when re-matched. The only other horse to finish in front of him is filly Saoirse Abu (another American-bred, this one by Mr. Greeley) who beat him at 2, but she has remained in filly races since that time – albeit in top company, taking on Natagora and Lush Lashes with respectable results. With the number of top-class American-bred turf milers in this crop (including Henrythenavigator, who is by Kingmambo) it seems a shame no one seems to care much about this division Stateside – I still maintain that Hard Spun could have really excelled as a turf miler – but I digress. Tomorrow’s feature is the two-mile Goodwood Cup; things look a bit easier for Yeats with last year’s winner, 5-year-old mare Allegretto, declared out with a minor foot injury. Yeats is by no means the only elder statesman in the race; the connections of nine-year-old Distinction are hoping for an upset. Yeats won this race in 2006 and will be carrying quite a bit of weight (something in the neighborhood of 138 pounds, if my math is not off, although that’s entirely possible — he enjoys a five pound penalty for his recent Gold Cup win) and his main rival may turn out to be stablemate Honolulu who seems to be improving at the right time (and who beat Distinction last time out). I’m with you all the way on Hard Spun. That horse was dead game. It was sad to see him whisked off so soon but I look forward to his foals. I am surprised that nothing was made of Henry’s interference with Major in the straight. Not bad but not even an inquiry.